I am sure that close to all of you are familiar with my feelings on seasonal weather forecasting, but for those of you that have not done so already, you might want to check out my "Soap Box Speech on Seasonal Weather Forecasting". The bottom line is, no one should be making any serious decisions, such as buying/not buying a sled or gear based on this or any outlook. With the usual disclaimer over, it is time to get down to the prognosticating. 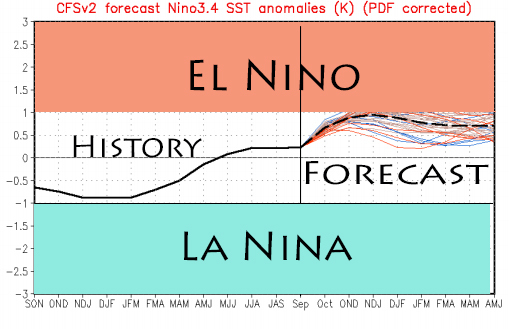 As usual, my first tool to dig out when producing this outlook is to take a look at the El Nino/Southern Oscillation (ENSO) levels and predictions. Since late last winter, the sea surface temps in the ENSO region have been warming and moved into the positive side by early summer and have been there since (figure 1). The level of temps is not warm enough yet to be classified as an El Nino. The forecast sees a further warming to occur as we head through the autumn and into the winter and possibly reach weak El Nino levels (figure 1). 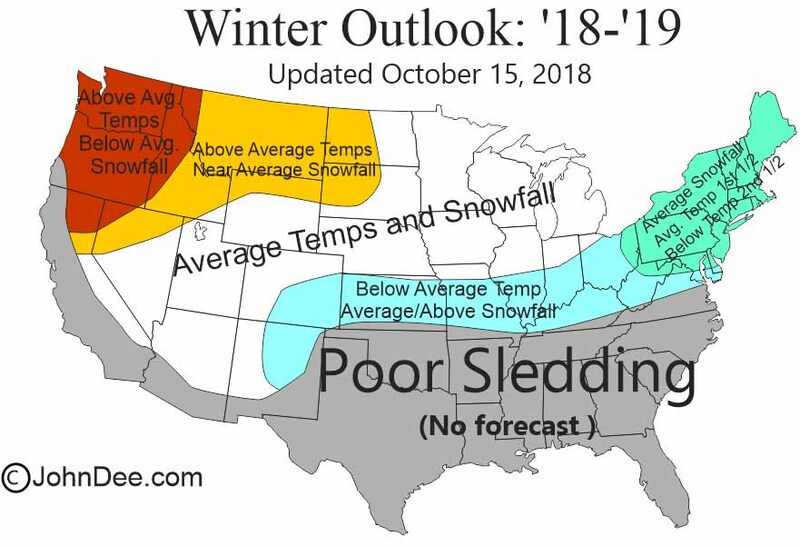 This is a concerning situation, as El Nino’s typically increase the potential for a warmer and less snowy winter across much of the traditional snow-play areas of the northern US. However, the good news, at this point, is that there is NOT an El Nino currently going on and the forecasts only call for a weak one to occur- if at all. I actually have less confidence in the models that a bonified El Nino will develop for this winter and more confidence that the sea surface temps and atmospheric conditions will be in the range considered neutral. I do have a handful of other tools that I have been developing over the years to produce my seasonal outlooks and each year they do seem to get more refined and more useful. I am still not even close to dismiss my Soap Box Speech on Seasonal Weather Forecasting, but the degree of errors in my seasonal outlooks has been on a down trend for several years (insert pat on the back here!). So, with that said, let’s get to the outlook! As usual, I am going to let the graphic do most of the talking and use the text to fill in the details or speak about things that cannot be represented on the map. The bottom line is that I think for most of the northern US, it will be a winter that provides close to average temps and snowfall. The exceptions will be across the Pacific NW, where temps look to run above average and snowfall below average, as well as across the northern Rockies and NW Plains, where temps will be above average, but snowfall close to average. An area of below average temps will occur with more prevalent clouds and precipitation across the southern US, with snowfall running near to above average. The NE US looks to see a fairly average first half of the winter in both temps and precip, with the second half continuing to see average snowfall, but below average temps. REGION 1 – The Northwest Midwest: The news for most of this region is OK. This may not be a standout year for snows in most spots, but overall, it looks like most of the region will see close to average temps and snowfall occur for the season as a whole. This should lead to a fairly decent season for snow-play. The exceptions look to be the further west in the region you go. Areas of the western Dakotas look to see an increased chance for temps to run warmer than average and thus better chances for some snow loss during thaws. REGION 2 – The Southeast Midwest: The news for this region is fairly similar or even a bit better than for the neighbors to the NW. Snowfall and temps both look to run fairly close to average, with an area of below average temps to occur across the OH River Valley. This colder than average setup could also cause more of the precipitation to fall as snow- rather than rain. My only other note to make is that folks should keep in mind what is actually average for their locale. Areas like northern IL, southern WI and southern MI see an 45-55” of snow fall on average. This does not typically lead to deep and lasting snowpack. Rather, it leads to having enough snow to play in during the second half of January and first half of February, sometimes longer if no major thaws occur. REGION 3 – The Northeast US: The forecast for this region is pretty good. It looks like snowfall for the season as a whole will run near average. The best news is the potential for temps to run below average for the second half of the winter. This could help to keep thaws from cutting the season short and could also lead to some decent Lake Effect snows off of Lake Ontario deeper into the winter. Lake Erie is likely to have enough ice on it by late January or early February to limit LES. REGION 4 – The Northern Rockies: Most of this region looks to see above average temps occur for the winter as a whole, but the good news is: 1) snowfall looks run near average in the typical riding spots and 2) the warmer than average temps should also not lead to any major thaws in the mountains, where most of the riding is done. For anyone hoping to do a lot of riding the valleys, maybe not so good. REGION 5 – The Central Rockies: This majority of the region looks to see temps and snowfall run near average for the winter as a whole. The exceptions would be in the far SE, where SE CO and NE NM could see below average temps lead to more snows than average, but this section of the country is typically not a big snow-play area. REGION 6 – The Pacific NW and Sierra Range: Most of this region will likely see below average snowfall and above average temps. Like the other mountainous regions, most of the snow-play is done in the higher terrain, so there will still likely be enough of snow fall to allow snow-play. REGION 7 – Eastern Canada: The story for eastern Ontario, most of Quebec and the Maritime Provinces is pretty similar to the Northeast US. Thus, I believe snowfall will be close to average for most areas and temps the first half of the winter will be near average, with increased chances for below average temps the second half of the period.